Google Now on Android has all sorts of awesome contextual searches 6 Google Now Features That Will Change How You Search 6 Google Now Features That Will Change How You Search You may already be using Google Now on your Android device, but are you getting all that you can out of it? Knowing about these small features can make a big difference. Read More , and they haven’t stopped adding more. 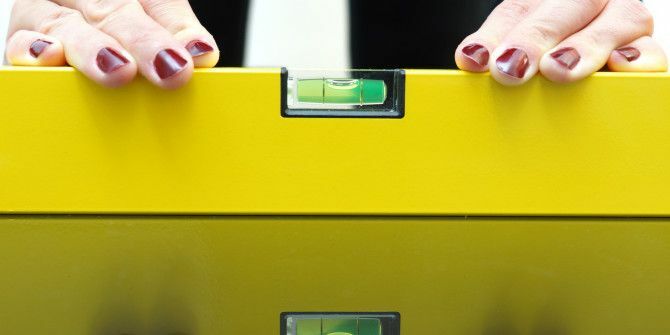 There are tons of apps you can use to make your phone into a virtual toolbox The 10 Best Free Toolbox Apps for Android The 10 Best Free Toolbox Apps for Android Want to turn your Android phone into a toolbox? Here are some useful Android apps for measuring distance, level, sound, and more. Read More , but Google just made some of those obsolete with its newest feature: a level tool. Simply search for “bubble level” in the Google app on your phone and you’ll have a little mini-level you can use to measure if something is even. iPhone users have had this tool built into their phones for a while (it’s hidden in the Compass app), but on Android it’s always required a separate app download until now. Of course, most of these tool apps require way too many permissions How Android App Permissions Work and Why You Should Care How Android App Permissions Work and Why You Should Care Android forces apps to declare the permissions they require when they install them. You can protect your privacy, security, and cell phone bill by paying attention to permissions when installing apps – although many users... Read More , making them a bad idea to use. Obviously this can’t replace real level, as your phone’s internal sensors can’t duplicate the real thing. Plus, your device might have the camera or some other piece jutting out on the back, preventing it from being fully level. Regardless, when you’re in a pinch and want to check something to be sure it’s level, this gives you a pretty good idea. Fun tool tip for Android phone users: use the Google search bar to find "bubble level" and one pops on screen. Your phone is now a level! And if nothing else, it’s something fun to play with for a few minutes. Go ahead, try it out and see how level the items around you are! Or, put your phone in your hand and try to balance it to exactly 0 degrees. Do you have use for a level on your phone? Let us know if this excites you (and what you measured) with a comment! So how does this level work? Is it all software? Does it rely on some kind of hardware device inside the phone? There are lots of sensors inside your phone that make it work, like the accelerometer and gyroscope. This little widget probably just uses those sensors and makes the data human readable in the form of a level. These sensors are the same way that your phone knows to auto-rotate, for instance.